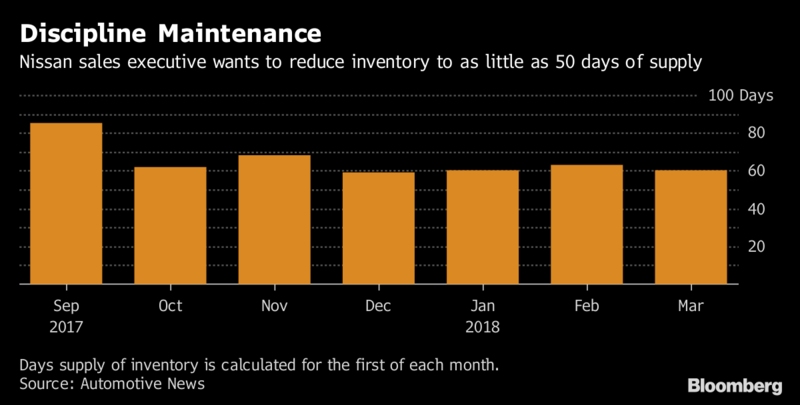 Nissan Motor Co. is slowing production at several assembly plants to keep the supply of vehicles on U.S. dealers’ lots in check after being caught off guard by weaker consumer demand. to rental companies and other fleet customers to help bring that number down. cut its earnings forecast for the fiscal year ending this month, as costlier sales incentives in the U.S. weigh on operating profit. Honda Motor Co. both lifted their projections. While Nissan gained U.S. market share last year, its 13 percent increase in incentive spending per vehicle was the biggest jump among the six largest carmakers, according to Autodata Corp. The company also boosted fleet sales by 15 percent last year, Zohaib Rahim, an analyst at Cox Automotive, said in an email. As of March 1, Nissan’s supply of vehicles was at 60 days, according to Automotive News Data Center. Mohnke, who was named a senior vice president in October, said he expects to reduce dealer inventory further in the April-to-June quarter.